Before we ever met our children, our social worker made sure that we read their child protection file. Although I will not go into great detail about the trauma that our children suffered before we met them, let’s just say that it was major trauma, and that our daughters have already lived through things that most people will never have to experience. Our social worker read their child protection file before she sent it to us. Before she sent it to me, she called me and told me that I would want to have a box of tissues at hand as I read it. She also warned me that, based on the report, she thought that the movie Toy Story could be a possible trigger for our daughters. Ironically enough, I had bought a Buzz Lightyear nightlight from the clearance department at Target a week before. I initially read the child protection file in my friend/colleague/mentor/part-time boss’s office. Don’t worry, I went “off the clock” to read it. It was very difficult to read. It made me sick to my stomach. It made me angry. It made me disgusted. I couldn’t believe that people (in particular the children’s biological mother) had allowed these beautiful and adorable children to be treated so poorly – and that she, herself, had treated them so poorly. I was saddened by how “the system” that was supposed to protect them had initially failed them and put them back into an unsafe situation. Anyone who has read their file (which is not many people – it’s not like we sent it out with our family’s Christmas letter or anything – but their therapists have read it) has said that our daughters are survivors and there is no doubt in their minds that our daughters have experienced trauma. A common diagnosis for people who have experienced trauma is PTSD, or post traumatic stress disorder. Parents who have adopted children who have experienced neglect, trauma, and abuse, often talk about the “letters behind their children’s name” or the “alphabet soup of diagnoses” that our children have. Unsurprisingly, both of our children have PTSD. Through therapy and skills workers, and psychiatrists and county mental health workers, and (for one child) day treatment, we are treating our children’s “alphabet soup” which includes PTSD. After our social worker told us to be careful about Toy Story being a trigger, I threw out the Buzz Lightyear nightlight I had bought the week before. I warned family members and friends not to mention Toy Story in their presence; after all, if my experienced social worker thought that Toy Story might be a trigger, then I thought it was important to avoid it at all costs. If only we knew then, what we know now. The thing about triggers is that they are not necessarily predictable. They are not always obvious. And, in our children’s case, Toy Story was not a trigger for them – not at all. Proof that our daughters aren’t triggered by Toy Story – they wanted to wait forever to ride Toy Story Midway Mania at Disney World. I think we waited 2 hours or something crazy to ride that ride. 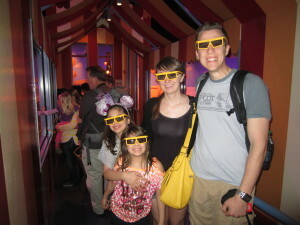 We all got to wear matching 3D glasses too! Instead, completely unpredictable things are triggers. Touching my daughter on the back of her head (I was trying to give her a reassuring pat on her back and missed) was a trigger one night and led to a meltdown, and then later on, it led to my daughter telling me a story (of abuse) from her past. Seeing hot sauce in a restaurant was a trigger. Being given bunny ears has been a trigger as it brings back a memory of one of my daughter’s bunny toys being used by a “bad guy” as an ash tray. 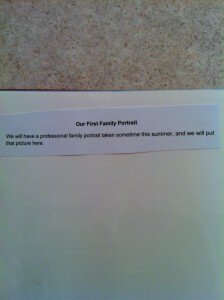 When our girls first found out about us, we gave them each a photo album so they could get to know their new family. In the back of the photo album, we put some pages (with room for pictures) of things we would do together in the future: Adoption Finalization Day, Adoption Finalization Celebration, and Our First Family Portrait. Our first summer as a family (last summer), we didn’t get around to taking family pictures. Then the school year happened, and all of a sudden it was summer again. Well, as we were going through our daughters’ rooms (to get them ready to paint) about a month ago, those albums made a reappearance into our lives. One daughter reminded us that we hadn’t done our “family portrait” yet. A couple of days later, one of my best friends from high school, who also happens to be a photographer, posted on Facebook that she was going to be in town and doing a limited number of portrait sessions. 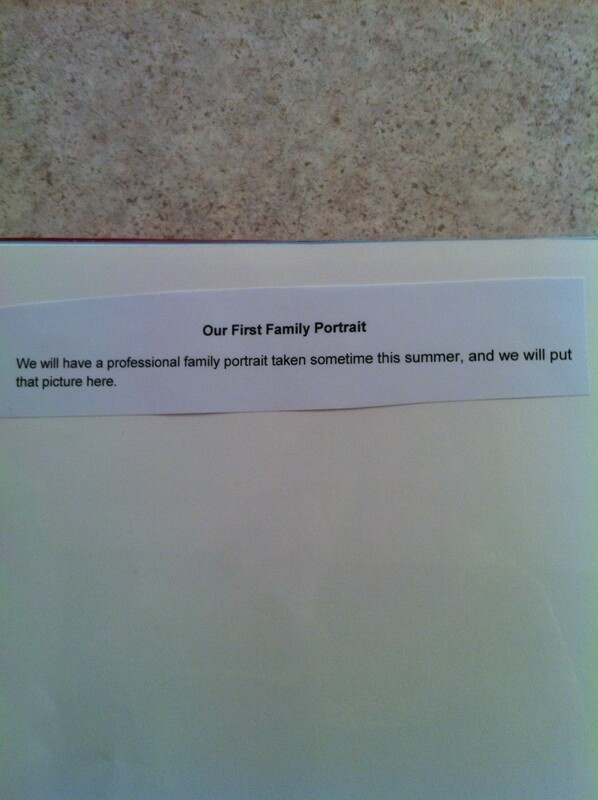 I decided it was time to tackle that family picture and get it done so my daughters’ photo albums would be complete. Because my daughter had wanted family pictures to happen, and because she was the one who reminded me that we still hadn’t done them, I hadn’t spent a lot of time thinking that we might “get” to experience a meltdown as part of the family portrait experience. Silly silly me. Apparently, my daughter who has RAD and PTSD (the daughter who reminded us to do this photo session!) was very triggered by the idea of us (the adoptive family) doing family portraits. It wasn’t a horrific meltdown that we experienced, although it felt like my child took several steps backwards that night, behavior-wise. We experienced behaviors (physical aggression towards Mom & Dad) from her that we hadn’t experienced since March and it was heartbreaking and disappointing. The bright side is that my daughter was able to verbalize her feelings of grief and loss (of her biological family) during therapy at day treatment, and with her skills worker, and with her EMDR therapist. The “not-so-bright side” is that Mom (me) is still hurting A LOT from that experience. 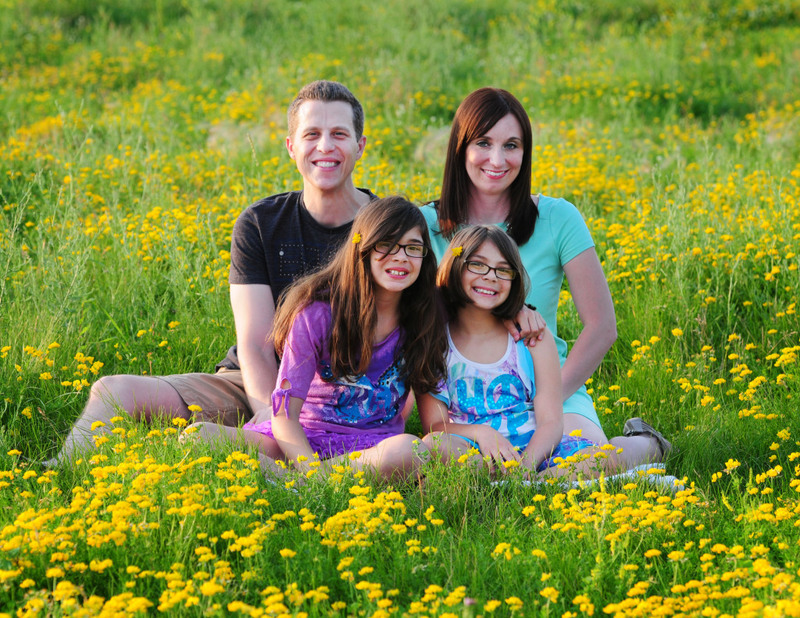 Luckily, our photographer was amazing and patient and everything you could ever hope for in a family photographer, and she was able to work with us and get some wonderful family portraits that we will use to fill the blank page in our daughters’ photo albums. Thank you, Becca!